Creating a post is one thing, creating a high quality post is another thing, and creating an SEO friendly post is another of another thing. Writing a post is easy and can be done by anybody, writing a high quality post is what defines you as a blogger, and then, writing an SEO friendly high quality post is what defines you as a Pro blogger. 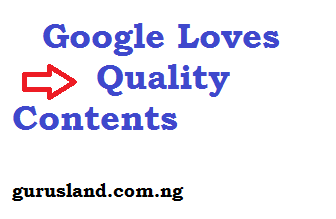 Without wasting much time beating around the bush, let’s quickly see the rules to posting high quality and SEO friendly articles, but before then, let’s briefly run down some definitions. Very important. You should know what a fish is before learning how to fish. What Is A Blog Post / Articles? It is an organized media content through which bloggers pass information to their audience, the media content could be in the form of text (mostly used), video, animation, images, presentation, polls etc. It can also be a combination of two or more media formats (example; text and images). What Is A High Quality Post / Article? This is a well edited and organized post with the potential of transferring information to a targeted audience. What is An SEO Friendly Post /Article? SEO means "Search Engine Optimization", SEO friendly Article is a high quality post that has been equipped, following all best practices, to be seen by search engines such as Google, Bing, Yandex etc. Believe me, every blogger wants his/her post to be at the top of Google search page. To me, it gives a sense of satisfaction and joy to see my post rank higher than every other post, but you are not the only Pro blogger On Earth, other bloggers wants same thing as you. So let’s see how to make your new post Out-Rank other older posts in search engine. Yes, you are not writing for spirits, if nobody is interested in reading your beautiful high quality post, then it is as good as a piece of trash, the audience, that's the number one consideration when writing a viral post. You will have to identify the problems of your audience with respect to your topic of choice, the possible questions they might be asking, their age grade, their gender, and possibly their level of literacy. You should know everything possible about your audience, because they are the consuming end of whatever you want to give out. Having Studied your Audience carefully, its time to know what your competitors are up to, believe me, no matter the topic you are writing about, there are posts already written on that topic, so you have to use the novelty of your post to your advantage. For example, in one of our previous chapters, where I wrote about the pros and cons of wordpress.com as a possible blogging platform for your new blog, my competitors cancelled out every possibility of earning from wordpress.com, because there was none when they wrote their post, but I have to counter their idea by updating mine with the possibility of earning with wordpress.com through their newly launched Wordads program, that's the idea, you need to know where your competitors are lacking, then capitalize on their mistakes. Having studied your competitors thoroughly, take some of their ideas that can be expanded and worked on. Like I told you in one of our previous chapters, Real bloggers don't copy Posts, they steal ideas, it’s time to organize your content, hope you still remembered the lecture on how to source for content for your blog? Now make a draft Of Your Idea, Organizing them in the best reasonable order. You will have to choose a tittle to start with, later (having expanded all your ideas), if necessary, you can adjust your title to accommodate all your ideas, because as your write, new ideas comes in, that's the spirit of blogging, so you have to choose a draft topic for your post. This is very important, most search engines only capture the first paragraph of your article which is presumed to contain your introduction. First of all your introduction should contain the targeted keywords gotten from your title. Secondly, your Intro should be captivating enough, because an average visitor will browse through the first paragraph and conclude if the article will be helpful or not. Content is king, you are now on the content, do your best with it, organizing your ideas into paragraphs, use synonyms where applicable to get a wider search coverage, you did letter writing in your elementary school days right? Yes, use that knowledge here, make good use of the necessary HTML or text editing attributes. Don't worry, HTML coding will be our topic of discussion in chapter ten. To keep readers to yourself and give them a sense of belonging and participation, you need to conclude your post with a call to action, a call to action can be either a request to comment, a poll, a survey, an exercise, an email subscription form or any other means to keep visitors on your blog a little longer. In the concluding section, it is ethical to seek opinions, ideas and contributions from your members. This is one big topic we will study in one of our subsequent chapters, but it’s good to let you know that you have to optimize your post for search engine visibility, by adding important keywords in the meta-slug of your post, adding tags, and reviewing all possible html errors on your post. You need to go through your post over and over again to check for possible spelling or grammatical errors which makes a post look unprofessional. Make the necessary corrections, now take a deep breathe because you are almost done. You will now have to edit the headline you initially chose to accommodate all newly added ideas, it should not be too long, Google only shows the first 65 characters and truncates the rest, make sure your headline is attracting and promising, don't mislead your audience with your title, it must have everything to do with the content. Make sure your headers contains your keywords also. THEN PUBLISH YOUR GREAT SEO FRIENDLY POST, AND WATCH IT BEAT OTHERS IN SEARCH RANK.